A Tennessee bill that seeks to prohibit students in public institutions from using the bathroom that does not conform to their gender at birth advanced Wednesday. With an 8-4 vote, the Tennessee House Administration and Planning Committee advanced House Bill 2414. It now moves to the House Finance Committee. The bill appeared to be dead late last month when it failed to win approval in the House Administration and Planning Committee. The Human Rights Campaign (HRC), the nation's largest LGBT rights advocate, released an open letter calling on lawmakers to abandon HB 2414 and its companion bill in the Senate (SB 2387). Joining in the effort are executives from Dow Chemical, HPE, Choice Hotels and Alcoa. Viacom made its own appeal in a separate statement. Similar bills have been proposed in several states, including South Dakota, where it was vetoed by the state's Republican governor, and North Carolina, where passage has led to state boycotts and a legal challenge. 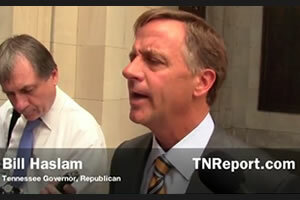 Republican Governor Bill Haslam has previously expressed opposition to the bill.